Several people suggested this book as one of the best science fiction books of the year, and I have to agree with them. It’s in what I think of as a growing category of future-imagining when society is based more on scarcity of resources (food, energy, etc) than we are today. This is a story set in a future, independent Thailand, and is fascinating in the way it takes so much of the rich cultural & political heritage of the never-conquered country and projects that into the future, both as a strength and a weakness. The book is quite graphic in some respects — fairly violent in places. But a terrific, if not terribly optimistic, novel. The main reason we moved to Palo Alto is for the public school options for SPL; the most compelling for us is a progressive school started in 1976 called Ohlone Elementary. Particularly compelling is a program within that school: their Mandarin Immersion program. For a lot of reasons I’ll maybe put into another post, we decided some time ago that it was important for SPL to grow up as bilingual (at least) as possible, and that Mandarin made the most sense as a 2nd language. Easier said than done, but at this point, at the age of 5 1/2, he’s reasonably fluent (we think), and we’re working hard on finding ways to support more over time. Ohlone is a unique program that blends progressive instruction with Mandarin immersion — it was started 3 years ago by some amazing people, including a friend of ours. At the Palo Alto Unified School District board meeting this past Tuesday, the board took up the question of whether to change the status of this Mandarin program from essentially a startup to ongoing status. Even though we had literally just finished up with the movers to our new house, we wanted to participate, so I went to speak, and what I said, essentially, is that we moved here for the chance to participate in the program (it’s a lottery, so chances are uncertain) — and that it’s a critically important and unique type of program, but that it shouldn’t be unique. We need more kids getting more chances to build more comprehensive world views, and that starts with language. Happily, the board approved a change to ongoing status for the program — a huge milestone for the startup program here. Kathy & I also sent a letter to the school board prior to the meeting — I’ll share it below. After living for 10 years in Sunnyvale, and more than 20 in the Bay Area, my husband John & I are moving to Palo Alto this week to give our 5 year old SPL the best opportunity for an exceptionally high quality public education in the area. And the specific school and program we’re most interested in is the Mandarin Immersion program at Ohlone Elementary. I’d like to share a bit of background on why we think it’s such a uniquely important program to support – for our own family, for children of Palo Alto, and for education overall. Neither my husband nor I have any Chinese background at all; I grew up in San Antonio and my husband lived in many states growing up, as his father was in the Air Force. I’m an educator and have taught science at several levels in the Bay Area and internationally. As a teacher over the last 15 years (and currently mentor teacher in East Palo Alto), I’ve built up significant theory and practice and have a strong belief in constructivist practice, as well as a strong focus on social-emotional learning, so you can see why we’re so interested in Ohlone generally. For my husband, in his job as CEO of Mozilla the last few years, he’s been traveling and working internationally quite extensively, including helping to set up their office in Beijing and working to build their Chinese efforts since 2007. He’s now transitioning from his Mozilla role to a new one as a venture investor at Greylock Partners, and China figures to be a large influence in that role as well. As you might imagine, once we decided that we wanted a bilingual experience for our now 5 year old son, SPL, Mandarin was an obvious candidate: it’s extremely relevant to today’s world. That was the idea. Figuring out how to give him a high quality dual language experience has been an extremely challenging enterprise. We were fortunate to have friends who walked this road before us, and they were able to point us to an extremely competent early childhood caregiver who was able to start with SPL when he was 3; at 5 he’s quite proficient in both Mandarin and English. So we were lucky as a starting point. We’ve spent much of the last year trying to figure out the best way to continue Sam’s Mandarin into more formal schooling as he enters kindergarten, and it’s a real challenge. There are, of course, several private options – but only 1 of them on the whole Peninsula had a strong constructivist approach, but the Mandarin is not immersion, and that school is, in any event, very much in the formative stages. And there’s CLIP in Cupertino, as a public school option, but we believe it’s a significantly more traditional Chinese approach to education than we’d like. Which leaves Ohlone. It’s a public school with an incredibly strong history. It’s got a focus on the whole child, including supporting discovery for each child. And the Mandarin program is immersive. That combination of characteristics, in our experience, makes Ohlone unique. That’s not something we say lightly, but we haven’t found any significant blending of progressive teaching techniques and strong Mandarin instruction in any context, let alone in a public institution. It seems to us a wonderful option for our own son, and one that’s sorely needed in an increasingly multi-cultural Bay Area and nation. And it seems to us that it’s an incredible example of modern, ambitious education that works, and can help others around the country follow. For all those reasons and more we strongly encourage you to support giving the program a more permanent status at Ohlone and PAUSD. Thanks for your consideration and efforts so far – the program’s been incredibly inspirational to us as we find our own way. I’m late in posting this, but wanted to write something about a tour I was involved in a couple of weeks ago: Silicon Valley comes to the UK (SVc2UK), and SIlicon Valley Comes to Cambridge (SVC2C), along with an additional trip to Silicon Valley Comes to Oxford, although I didn’t go on the Oxford portion. It was a really fantastic trip, organized by Sherry Coutu and Reid Hoffman, and it was absolutely packed with interesting events and people. The crew from Silicon Valley (which generously roped in folks from Vancouver, Washington & NYC as well) was a great group — interesting and diverse — and interested and curious about each other and the technology landscape globally, and specifically in the UK. It included senior people/founders/chairs from Kiva, LinkedIn, Facebook, Google, oPower, Mozilla, Creative Commons, DoSomething.org, as well as investors from August, Index, and Greylock and more — very broad. But the stars of the tour were the people we got to meet. During the 4 days, we had 23 events scheduled that reached 2,700 people. The first day we started in London talking with people who run the UK government at the House of Commons — we had several MPs in attendance, and were hosted by the Speaker of the House of Commons in the fantastic Speaker’s Chambers. A few of us got to give short prepared remarks at the beginning of the session; mine are here. After that, we were hosted by Google to talk with entrepreneurs from around London, also a great session, and had an interesting dinner with more folks from the London startup scene in the BT Tower. The second day, hosted by NESTA, we got to meet many first time London entrepreneurs and it was a great, great time. There’s clearly a ton of interesting and fast startup activity happening in the UK currently, and it was neat to have a firsthand look into it. Was also fun to share some of our own experiences from Silicon Valley. After that we hopped on a bus to go to Cambridge, which was an altogether different experience — also fantastic. First a bit of history: Cambridge University was first established in 1284, and counts a number of incredible thinkers amongst its alumni: Isaac Newton, Francis Bacon, James Clerk Maxwell, Crick and Watson and many, many more. And it’s been the home of seminal computer breakthroughs — it’s where Charles Babbage and Alan Turing did their work. Over the past few decades, it’s also had an incredible run in terms of tech industry output, including being the birthplace of ARM Holdings as well as Autonomy. We spent Friday at the Judge Business School at Cambridge, in a variety of panels, talks, and “surgeries” helping new startups think through their strategies and priorities. The high point for me, I think, was being able to talk with the 3 recent winners of a national entpreneurship contest — 3 teenage girls who’ve started their own venture. Great to be able to meet them and talk for a bit. Saturday we spent time at the Hauser Center talking with a ton of interesting startups, and helping where we could. 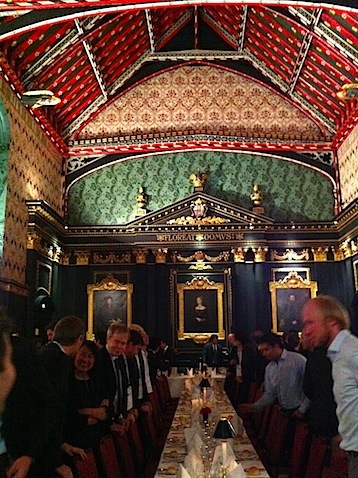 On each of the three nights in Cambridge, we were very fortunate to be able to have dinner in one of the colleges: Queens (shown in my picture above), Peterhouse (the oldest), and St. John’s. One of the unexpected delights for me was that we were able to attend Choral Evensong in The Chapel of St John’s College on Saturday night — it’s a liturgy that’s been sung in that particular chapel since the 1670s. It was amazing for me to be able to attend that — as an adult, I haven’t been to church with any regularity, but I attended Methodist and Presbyterian churches growing up, and Dad has sung in choirs everywhere we’ve gone (and still does). It reminded me of listening to some of that music growing up, but the other reason that I liked it (other than that the music was exceedingly beautiful) is that it’s in such contrast to the hyper-paced, global, 24/7, always connected, media slammed life that we all live today. It allowed me to pause a bit, to reflect on what it means to be devoted to a cause, to spend your life trying to express ideas (in music or otherwise), and to think about things larger than just what products are released today that we can buy each other for Christmas. I doubt that I’ll ever be a particularly religious person again in my life, but I felt very lucky to be able to attend Evensong and think some about perspective and pacing and commitment. Anyway, it was an incredible trip — Sherry and Reid did a masterful job in putting it all together — it was a little overwhelming, to be honest. There are some great things happening in London and Cambridge, and I can’t wait to see where they go.